There are times when you don’t actually want a roof over your head all the time when outdoors so you can make the most of the weather. Fixed roofs can trap in heat and block out wind and light on days when it would be most enjoyable to sit outdoors and enjoy the surrounds of your own outdoor entertaining area. This is where a retractable sun shade, such as a roof that lets in or keeps out as much of the sun as you want, can be the ideal choice for people who want flexibility when it comes to their outdoor area. A retractable roof creates a more functional and useable outdoor area. When in place they block out harsh UV light and provide protection from the elements, but on milder days they can be retracted to let you enjoy the weather. They are beneficial to the indoors of the home as well. They can prevent heat from the sun hitting your windows in the warmer months and heating up the home. Conversely, in winter when opened they allow the natural light to pour into the home and create warmth. Retractable roofs are certainly not a ‘one size fits all’ proposition. They need to be custom-made for your particular area and fitted by experts. In many cases they are an excellent alternative to a pergola because of the added flexibility they offer. They can be moved into the ideal position by hand-cranking or using a motorised system. They don’t have to be opened or closed all the way either. They can be partially opened and adjusted regularly with minimum fuss to make the most of the weather. Many homeowners opt for two or more sections of retractable roofing that can be operated autonomously for the ultimate in climate control. Installing a retractable roof is also a style statement. They come in a range of styles and finishes that can complement your existing décor or tie in with other parts of your home, such as the shade of your security doors or the trim of your gutters. Some properties may even have permanent glass roofs in their outdoor entertaining zones and these retractable shades are the perfect way to prevent these areas from turning into a greenhouse. 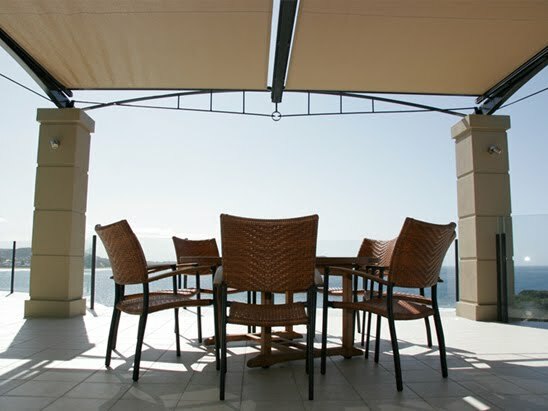 People are also more adventurous when it comes to the design of outdoor areas today and retractable sun shades are an ideal fit where something more unique is called for. It’s not just homeowners who make use of retractable roofs. Restaurants with alfresco areas are utilising this outdoor option as it gives them flexibility with guest seating. So no matter what the sky looks like, diners can be offered protection from the elements yet the area can be opened up to take advantage of the sun in the cooler months. Some schools, day care centres and even playgrounds make use of these retractable sun shades because of their flexibility. So if you like the idea of an all weather outdoor entertaining area, you might be best to consider a retractable roof. It means that you can enjoy your entertainment area in comfort, all year round! Great piece of writing. I loved the contents.